A HUGE joy for me with my shop is explaining the history, culture, and use of items in magcikal practices around the world. this provides accurate information for us to add to your own magickal repatoire and also expands our knowledge of history, culture and others' practices. I went to purchase one of these candles for my own personal use, as I have been hording my last one for 10 years because it was the last of a batch I bought from a root shack that was going out of business. I didn't know if i'd find anymore again and honestly, the energy from that candle was so powerful it didnt even need to be lit- damn! any good worker I have known uses these candles to perform workings and to recommend to clinets for personal use. It is the most powerful candle in my opinion. So, I started searching for one of these candles only to find that EVERY site that carried it didn't even know what the hell it was! These sites described them as a "cross candle with celtic and floral motiffs"....what?! These candles are NOT Celtic and NOT floral! They are actually created to show several powerful conjure symbols; 1) the flaming cross or crucifix 2) the bible in the center 3) two arms and hands reaching out from the bible along the sides of the cross 4) 2 keys coming down from the bible Each of these candles, no matter the colour, is created for conjure work. Though the colour is taken into account of course; white for exorcism, black for enhancing conjure work or protection, red for love, green for prosperity, brown for courtcases, orange for change and opportunity, pink for romance or relationships, and yellow for devotion. The flaming cross represents the crucifixion of Jesus. The keys represent opening and closing, initiation, knowledge, mystery, and curiosity-1 to open a door and 1 to close another. The hands outstretched are the hands of God, comforting you, directing you and opening your paths. The bible in the center, obviously another symbol of Hoodoo's Christian roots and the power, knowledge, answers, and wisdom of the holy book. These candles are the stongest you can get for conjure work and truly encompass and master the energies you are working with. 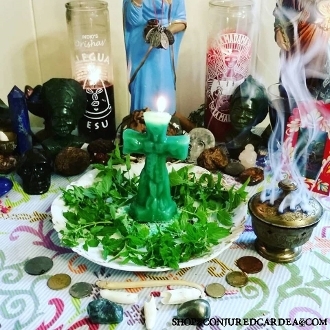 This listing is for ONE GREEN Master Key Crucifix candle that I have personally loaded in the traditional hoodoo fashion. The candle is 5 inches tall. thanks for looking! curio only.